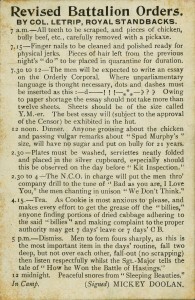 Soldiers often turned to humour to alleviate the stress of life in the trenches. Jokes, puns, and satirical songs were a part of the soldiers’ oral culture. Much of the humour was lost on those outside the soldiers’ group, but it resonated with the soldiers and allowed them to cope with the strain of service and combat. Cartoons, many of them published in trench newspapers, carried important messages about trench life. 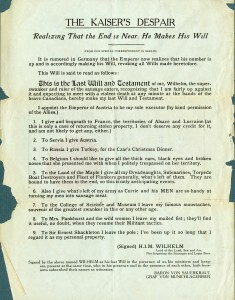 The cartoons could be satirical, silly, or subversive in character, making fun of officers, the army, or the war itself. 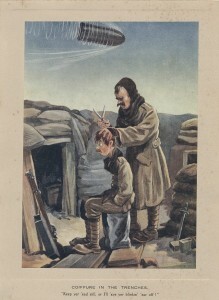 In this cartoon by famed British soldier and artist Bruce Bairnsfather, one soldier gives another a haircut while a shell flies overhead. The barber tells the anxious soldier to keep his head still or he will cut his ear off. Bairnfather's cartoons of trench life were published in the British newspaper, The Bystander, and proved extremely popular among Allied soldiers.